The Port of Brownsville has won the top award for financial reporting for the sixth year in a row. 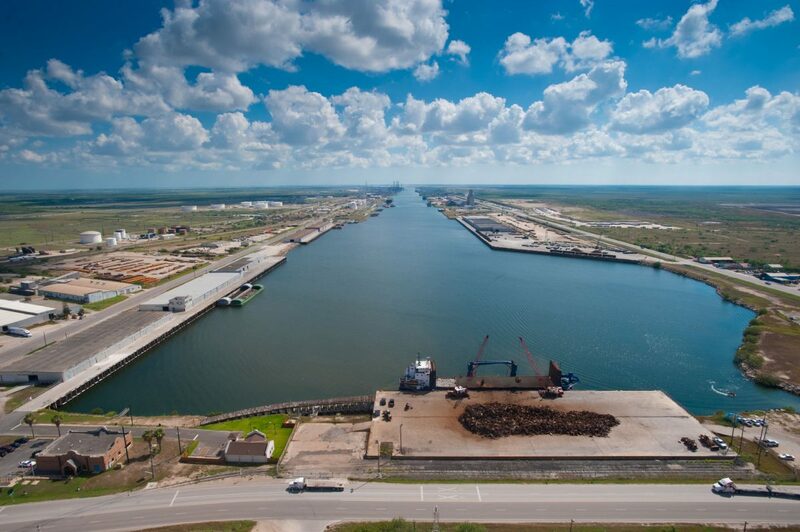 Pictured is the Brownsville Ship Channel at the port. An increase in U.S. oil exports and foreign demand for domestically refined gasoline and diesel is driving new development at the Port of Brownsville. creation of the Jupiter Exp­ort Terminal, which the com­pany said will allow it to load/unload vessels up to 65,000 deadweight tons at a rate of up to 30,000 barrels per hour. Jupiter also said it received approval to build up to 2.5 million barrels of storage for hydrocarbons, and has permission to blend refined petroleum products such as diesel and gasoline. Crude oil would be delivered to the “transloading” facility via rail tanker car before processing and export. The company said it expects the export terminal to be fully operational in 2020. Jupiter is currently moving diesel through the port through a third party, according to Port Director and CEO Eduardo Campirano. In its announcement, the company also said it is starting the permitting and engineering process for the addition of two private docks at the port, plus the Jupiter Offshore Loading Terminal, which would accommodate Very Large Crude Carrier vessels six miles off the Texas coast. Also, the company has proposed the Jupiter Pipeline, which would connect its Port of Brownsville terminal with the Permian Basin oil fields in West Texas. Jupiter expects the 500,000-barrel-per-day pipeline to be complete during the second quarter of 2020. Campirano said the proposed pipeline, the extra private docks and offshore terminal project fall should be considered “Phase 2” projects and that “it remains to be seen” whether they will indeed happen. Phase 1, which has been permitted, encompasses construction of additional storage tanks and installation of a hose rack on the liquid cargo dock, he said. “That’s for them to be able to store their hoses when they connect to the vessels for whatever commodity they’re going to be exporting,” Campirano said. Still, Jupiter’s Phase 1 is a significant development, and comes amid a building boom driven by the rise in U.S. crude exports and foreign demand for refined fuel.